As a project manager within the construction sector you’ll be overseeing concepts, designs, operations and commissioning, as well as liaising with clients and working on projects and construction sites. On the course you will study topics such as building technology, information technology, construction materials, construction surveying, environmental engineering and scientific design and construction of buildings, including cost and contract administration. You will develop a combination of technical, managerial and communication knowledge and skills through site visits, field trips, practical laboratory workshops and the latest technologies. This includes the opportunity to learn Building Information Modelling (BIM) to level 2, giving you a competitive advantage when you graduate. You will study and work alongside students from related courses on interdisciplinary projects that reflect the professional working environment. The option of a work placement year helps to cement your learning and build both your experience and network of professional contacts. 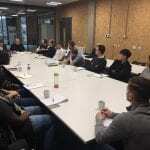 Senior representatives from construction companies, architects and surveyors from around the region meet regularly at our industrial liaison panel to review our courses, ensuring they remain up-to-date and relevant to industry. 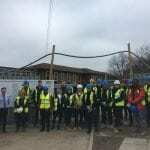 Accredited by both the Chartered Institute of Building (CIOB) and the Royal Institute of Chartered Surveyors (RICS), exempting graduates from the chartered membership examinations. Our course is also accredited by the Chartered Association of Building Engineers (CABE), providing the opportunity for further learning leading to Chartered Engineer status (CEng) under the provisions of UK-SPEC. Core modules become more tailored to project management for construction from your second year. In your final year you are able to apply what you have learned to more complex projects, communicate your ideas effectively, complete your final year project and have the freedom to choose optional modules in areas that interest you most. You will learn through lectures, tutorials, seminars, laboratory practicals and coursework. You will also take part in fieldwork, workshops and projects both individually and in group projects, often with peers from related courses. In your second year you will build on the knowledge and skills you have gained in your first year and begin to explore aspects of project management for construction in more depth, including Building Information Modelling (BIM). 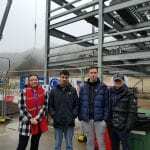 Students have undertaken placements within organisations such as RG Group, ISG, Wates, Kier, Willmott Dixon, Osborne, Mace, Buro4 and Morgan Sindall. In your final year you will develop and complete your individual project. You will also choose from option modules, giving you flexibility to specialise in areas that interest you most. Upon graduation you’ll be equipped with skills in public safety, cost management and mathematics and ready to work in all sectors of the industry including residential, commercial, civil, industrial and environmental. Graduates have undertaken careers in Morgan Sindall, Kier, MACE, Osbourne, Buro4, Willmott Dixon and the RG Group.